Kimono Art Studio creates art from vintage Japanese Kimonos. “Currently, my line includes assorted decorative pillows, table or mantle runners, lamp shades, wall art, aromatherapy eye pillows, blank greeting cards, purses and neck/head/waist scarves. “I disassemble all the cleaned garments by hand and iron all the pieces before I begin my design process. Once my art is complete, you may notice subtle remains of the fabric’s past life. There may be a faint crease, a teeny line of needle holes from an original hand sewn seam, or a faint smudge or fading. I consider these beauty marks to validate its historical spirit. They add to the beauty and patina sought after in unique antiques and one-of-a-kind handcrafted art." Kimono Art is designed from vintage Japanese kimono, haori and obi… one of a kind… one at a time. 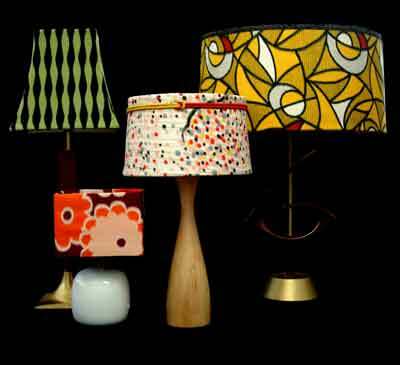 Whether you're looking for a custom lamp, pillow or other creative textile item, I would love to work with you. Feel free to look through my portfolio for a sample of my work. If you have any questions, please contact me at CONTACT link above. to other websites that feature my art.